A h-kar ah-med du ti su, nag-po xi-xi mal mal…so, ha! Done. 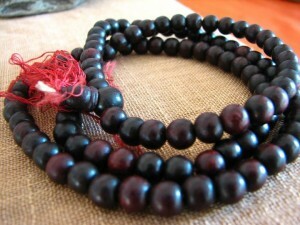 3,000 healing mantras, counted out on my brown wooden mala. It would have gone faster if I muttered my way through them, but when i chant them i feel the vibration through the top of my skull. But Geshe YongDong directed, for chanting, “say it 3 times, or 7 times, or 21 times – no more”.Â Why no more, I asked. He shook his head. “Oh no,” he said pursing his lips in serious mock-seriousness. Your voice will get tired.” And it would, so it has taken me two months to do. GesheLa prescribed the 3,000 mantras back in July, at the retreat here at Dorje Ling. When healing was so called out for, by the island community at large and the sangha in particular. And by KennyLa, who rocked the karmic boat as ever, ripped off the bandages and laid the pain bare on the table. I have always been suspicious of such endeavors – 3,000 mantras, 100,000 prostrations, three years in retreat, and you get a set of steak knives. Tic tac toe. Arbitrary numbers assigned to meaningless tasks. I kind of wondered if it was a “guy thing”, to be so goal-oriented. Noting sarcastically that men are so often like dogs, always needing a bone to fetch, a target to hit. Fixated on the goal, impatient with the process. The goal is 3,000 mantras – just a number. But the intention is healing. Healing for my sore hip, for my questing heart, my many psychic scrapes and bruises, my reactionary ways. Healing for Pablo and Darren and Jana and Ray, for Sharai and Terry and Ki, for Leon and Bennett. Healing for the Gulf of Mexico, healing for the ocean, healing for the air. Healing for Bridgeview and Clayoquot, for Madagascar and Israel and Guatemala and Tibet. Healing for the blighted pines and the toxic belugas, and the sad stumps of the cabbages eaten by the deer. Healing, of course, for Kenny. Healing for all beings. The numbers are the joke that keep overachievers like myself on the razor’s edge. Less than 3000 prostrations in to my 108,000 commitment I am joyous and terrified at being bound to the same practice for 3-4 years. It works though. Rapidly and seamlessly awareness slips in, perceptions jolts, gaps and life overflowing, ahhhhh. We are so lucky. Thank you for making this blog and bringing the feeling of sangha close!